With 2,000 years of history, Chester is spoilt for choice when it comes to celebrating historic events. The festive season welcomes back the City Watch from the 1400s and the Roman Legion from 47/48 AD. The Chester Winter Watch parades take place on Thursday 6 December at 7pm with a second performance on Thursday 13 December. The Winter Watch parade takes its inspiration from ‘Setting the Watch’ a ceremony held at Christmas in the 1400’s. The City Watch was Chester’s early police force. They took control of the keys to the city after processing around Chester to ensure it was secure. This was followed by a banquet and celebration of Christmas by the city leaders. 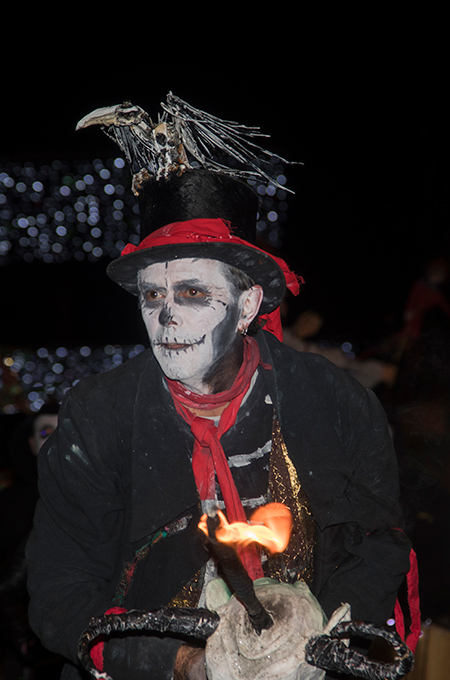 The parades bring back the City Watch joined by a cast of Angels, Devils, Fire Skeletons, Dragons Ice Queens, Jack Frost and Cooks with their Victorian Christmas Dinner and Chester’s Karamba Samba leading the parade as a ghost band. They start at the Christmas Market in Town Hall Square, passing Chester Cathedral, turning right into Eastgate Street, Bridge Street, then returning to the Town Hall Square via Northgate Street. Councillor Louise Gittins, Cabinet Member for Communities and Wellbeing, said: “This Christmas we’ll be time traveling around the centuries, being Chester it’s only fitting that our final celebrations should be with the Romans. 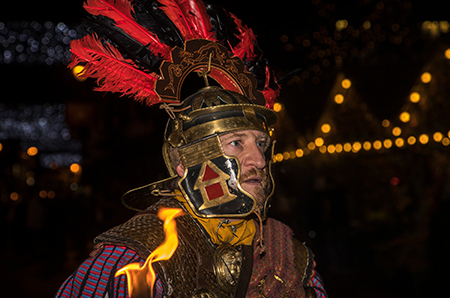 Chester Roman Tours will light up the city centre with flaming torches whilst their Emperor Domitian will preside over the legion”. Soldiers from the Deva Victrix 20th Legion take back control of their city on Thursday December 13. Chester will return to Roman rule for one night only as Chester Roman Tours celebrates Saturnalia. The Saturnalia parade leaves the Grosvenor Museum at 6.30pm. After arriving in Eastgate Street the Emperor Domitian will address his subjects before releasing the Lord of Misrule. Saturnalia was the feast at which the Romans commemorated the dedication of the temple of the god Saturn. Saturnalia was originally celebrated in Ancient Rome for only a day on December 17 but it was so popular it extended to a week, from the 17 to 23 December, despite Augustus' efforts to reduce it to three days, and Caligula's, to five. Saturnalia became one of the most popular Roman festivals. It was marked by tomfoolery and reversal of roles, with slaves and masters switching places. Clothing was relaxed and included the peaked woollen cap that symbolised the freed slave. A member of the familia (family plus slaves) was appointed Saturnalicius princeps, roughly, Lord of Misrule. Adding to the spectacle, the Winter Watch Parade will be sharing the stage for their second festive parade, joining with the Roman’s as they reach the Christmas Market in Town Hall Square.